Soufrière Hills (Montserrat). Dome growth continued during 15-22 January and activity was variable. Cycles of vigorous ash venting, rockfalls and pyroclastic flows occurred every six to eight hours. Light ashfall occasionally occurred in NW Montserrat. On 18 January a small lava-dome collapse from the W side of the volcano generated a large pyroclastic flow that traveled 4 km down Gages Valley into Spring Ghaut, and into Aymer’s Ghaut, reaching the sea at Kinsale to the S of Plymouth. Ash clouds associated with the pyroclastic flows rose to 3 km a.s.l. Several houses in Kinsale seen from a helicopter on 22 January had been buried or were burning. The Hazard Level remained at 4. Tungurahua (Ecuador). Explosions were detected by the seismic network during 20-26 January. Observations were frequently prevented by bad weather. Ash plumes were sometimes seen rising to 5.3-8 km a.s.l. Ashfall was noted almost daily in areas to the SW and sometimes to the W and NW. Roaring noises, ‘cannonades’ and vibrating windows were reported. During 20-23 January lava fountains and explosions ejected incandescent blocks onto the flanks, and blocks were seen rolling down the flanks on 24 and 25 January. An explosion on 26 January generated an ash plume that rose to 9 km a.s.l. Ashfall was reported in areas to the NW, W and WSW. Barren Island (India). Darwin VAAC reported that on 23 January an ash plume rose to 3 km a.s.l. Ash was not identified in satellite imagery. Batu Tara (Indonesia). Darwin VAAC reported that on 23 January an ash plume rose to 1.5 km a.s.l. and drifted 25 km E.
Chaitén (Chile). During 5-19 January the lava-dome complex continued to grow, although possibly at rates lower than during previous weeks. The magnitude and number of hybrid earthquakes decreased. The Alert Level remained at Red. Fuego (Guatemala). Explosions on 22 January produced grey plumes that rose to 4.4-4.8 km a.s.l. and drifted 5-12 km SW. Incandescent material was ejected to heights of 75 m and avalanches descended the flanks. Based on analyses of satellite imagery, Washington VAAC reported that on 25 January a dense ash cloud drifted 15 km NW. On 26 January an ash cloud drifted 11 km W.
Gaua (Vanuatu). Wellington VAAC reported that on 21 January an ash plume rose to 3 km a.s.l. and drifted S. An ash cloud was seen in satellite imagery on 26 January. Karymsky (Russia). During 15-22 January seismic activity was above background levels, possibly indicating that ash plumes rose to 3 km a.s.l. Analyses of satellite imagery revealed a daily thermal anomaly over the volcano. The Level of Concern Colour Code remained at Orange. Kilauea (Hawaii, USA). An active lava surface about 200 m below a vent in the floor of Halema’uma’u crater was observed during 20-26 January. The lava surface occasionally spattered, and both rose and drained through a hole in the cavity floor. A plume from the vent drifted in multiple directions, dropping small amounts of ash and occasional fresh spatter downwind. Lava from beneath the Thanksgiving Eve Breakout (TEB) and rootless shield complex flowed SE through a lava tube system. Thermal anomalies detected by satellite and visual observations revealed active lava flows on top of the pali from lava-tube breakouts. During an overflight of Pu’u ‘O’o crater on 19 January scientists saw a recent but inactive lava flow across the bottom of the crater. On 22 January a small part of the crater rim collapsed in front of the web camera, revealing an incandescent vent at the base of the E wall. During 23-26 January, incandescence was seen from the vent, as well as from high on the E wall, the crater floor, and low on the S wall. Kliuchevskoi (Kamchatka). During 15-22 January seismic activity was above background levels and lava continued to flow down the NW flank. Strombolian activity periodically ejected material 300 m above the crater. Phreatic explosions from the front of the lava flow ejected material that rose to 4.5-8 km a.s.l. Satellite imagery also revealed a large daily thermal anomaly at the volcano. The Level of Concern Colour Code remained at Orange. Tokyo VAAC reported that during 22-23 January ash plumes rose to 7-10.1 km a.s.l. and drifted NE. Llaima (Chile). Seismicity was reported on 22 January to have decreased during the previous few weeks to background levels. The Alert Level was lowered to Green (Level 2). Sakura-jima (Japan). Tokyo VAAC reported that during 20-26 January multiple explosions often produced plumes that rose to 1.2-2.4 km a.s.l. and drifted NE, E, SE and S. On 23 January, a pilot reported that an ash plume drifted SE at 1.8 km a.s.l. Santa María (Guatemala). On 21 January ashfall was reported in areas near the Santiaguito lava dome complex. On 22 January an explosion produced an ash plume that rose to 3.2 km a.s.l. and drifted SW. Washington VAAC reported that an ash plume seen on satellite imagery drifted less than 10 km. Shiveluch (Russia). During 15-22 January seismic activity was above background levels, possibly indicating ash plumes rising to 4.7 km a.s.l. Analyses of satellite imagery revealed a large daily thermal anomaly from the lava dome. The Level of Concern Colour Code remained at Orange. 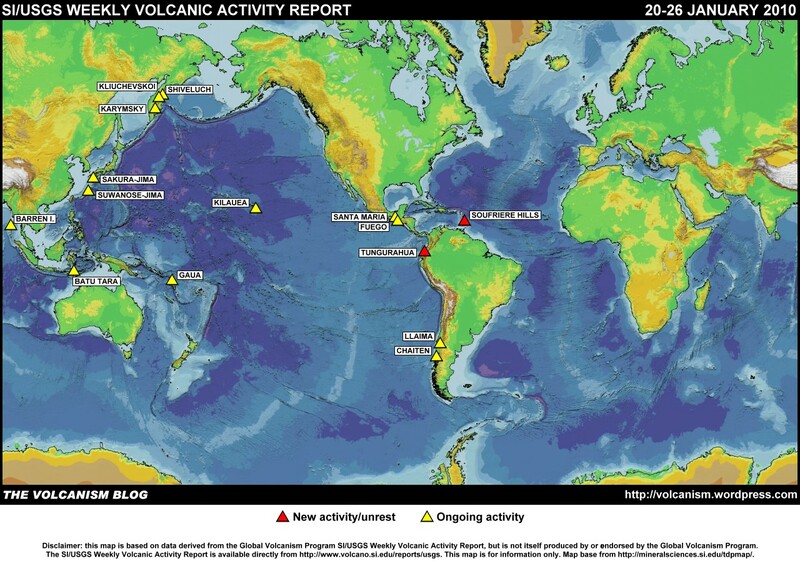 Tokyo VAAC reported that during 23-24 and 26 January eruptions produced plumes that rose to 3-4.6 km a.s.l. Suwanose-jima (Japan). Tokyo VAAC reported explosions during 22-26 January. On 24 and 26 January, plumes rose to 1.2-1.5 km a.s.l. 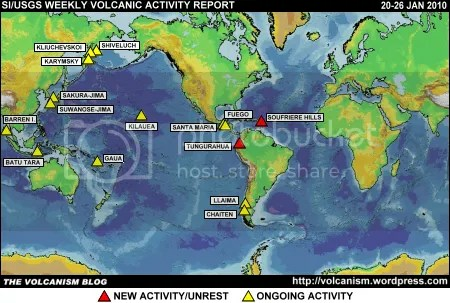 The foregoing is a summary of the Smithsonian Institution/United States Geological Survey Weekly Volcanic Activity Report covering 20-26 January 2010. It is provided for information only, and is based on but not a substitute for the full report, which comes with its own criteria and disclaimers. The map base is derived from the Smithsonian Institution/USGS/US Naval Research Laboratory This Dynamic Planet website. The OVDAS page has updated its information on all the volcanoes (including Peteroa).